Each year, the Atlanta Community ToolBank hosts several key fundraising and community-driven initiatives. Thanks to the generous support of local companies and civic organizations, we have equipped over 500,000 local volunteers to date. Your support will ensure the mission to keep local communities equipped to build and sustain a better lifestyle for all will continue to thrive. unique way for you to be involved. 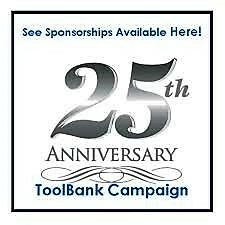 Sponsor 25/$2500 – 25 different opportunities to sponsor us in this year of celebration. Click icon below to view PDF of Sponsorship Package.